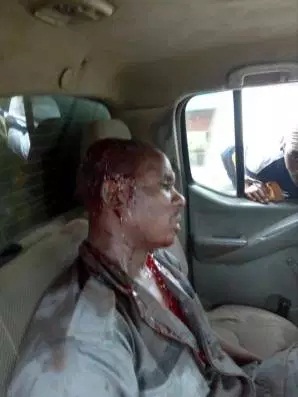 A crowd in Ogun State, on Saturday attacked and nearly set ablaze an official of the Nigeria Customs Service for going after smugglers. The officer was in hot pursuit of some fleeing suspected smugglers when some people in the area suddenly attacked him, Joseph Attah, the national spokesperson of the Customs, told PREMIUM TIMES, Tuesday. Mr Attah said the incident happened around Papalanto, near Ilaro, Ogun State. A video of the incident posted Tuesday on the customs’ Facebook page shows the unidentified officer, in his service uniform, being dragged on a muddy floor by the roadside. The bleeding man is seen crying and begging the irate crowd not to kill him. A man behind him is seen holding a plastic containing some liquid suspected to be petrol, while the crowd continued to push the helpless officer closer to a tyre, apparently to set him ablaze. They left him and ran away on sighting a rescue team, Mr Attah said. Mr Attah said the agency sourced the video from the social media. Mr Attah said it was becoming a trend for Nigerians to be indifferent about what government agents go through in their line of duty. It is rather common to see people sympathize with, and support smugglers, he added. “When something happens and a member of the public is wounded, or sometimes it gets to fatality, you’ll see people sympathize and share it on the social media. You’ll see it on the front-page of newspapers. “A customs officer will be chasing a smuggler and the smuggler would find it so easy to mobilize people against the customs officer? Is that the way to go? Mr Attah said it was shocking that Nigerians have refused to see smuggling as a crime. “The people should know that smugglers, and not customs officers, are their enemies,” he said, adding that the media has a duty to enlighten Nigerians on the dangers of smuggling.